special just for him - thanks Auntie Lynn! We thankfully had no problems at the check-in counter and therefore it wasn't long before we had to say goodbye to our amazing facilitator in order to go through security... I cannot say enough about this wonderful woman; when everyone else said that Samuel's needs were too severe, rendering him "unadoptable", she looked past the labels and saw his potential and fought hard to find him a family! I would not have my son with me today if it were not for her. The first, two hour flight to Hong Kong went so well. Samuel hopped right into his seat, bucked himself in and was ready to go! 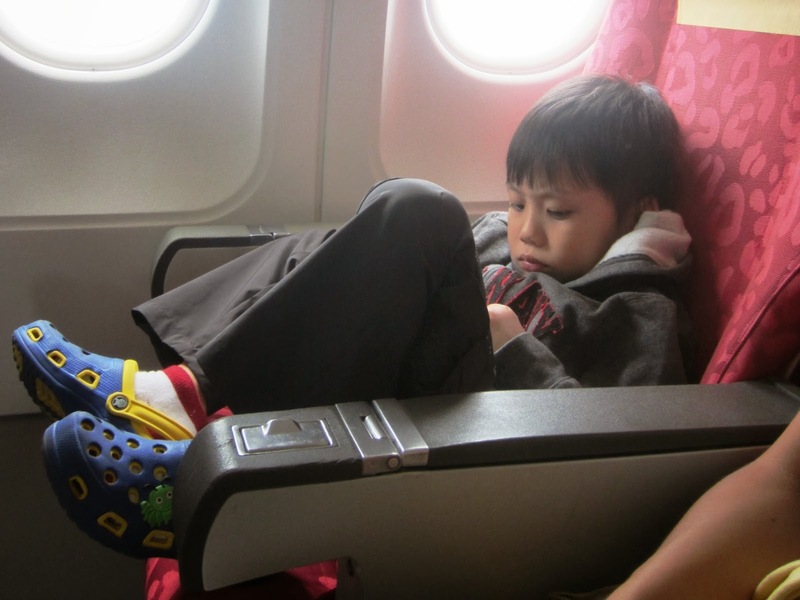 He amused himself throughout the flight by playing with his armrest, eating his meal, etc. and before we knew it we were landing. He proudly put on his backpack to get off the plane with a smile on his face and all I could think was, "Dear, sweet boy... you have no idea what still lies ahead". My first plane ride ever - this is exciting! Samuel loved his cozy new sweatshirt... especially the zipper! That wasn't so bad... What was all the fuss about?! When we arrived in Hong Kong we waited for the stroller which we had checked in at the gate in Hanoi. They told us to take the bus to the terminal and they would bring it to us there but right away I had a sinking feeling in the pit of my stomach that we were in trouble... Long story short, the people unloading the plane were "too busy" to get us our stroller and simply sent it through with all the checked baggage. This meant that my mother had to go through immigration, pick up the stroller at the baggage claim and then come back through security with it. I could have tried going with her but I had no desire to go through Hong Kong immigration with my newly adopted son's temporary passport and Samuel was already starting to go crazy and there was no way he would survive that long line of people without his stroller. So, what does one do when stuck in an airport waiting area with two backpacks and a 50 pound little boy who refuses to walk??? Well, you start by singing all of the Fisher Price Learning Puppy songs that you have involuntarily memorized over the past twelve days! The people sitting around us certainly thought I was crazy but it worked. Samuel was highly amused by his mama's imitation of his beloved puppy (who was packed in the checked luggage) and sat with me quite contently waiting for grandma to come back. I was so proud of him. After an hour an a half I saw my mom waving us down from behind the barrier. She had the stroller with her but was told that, as I had been afraid of, after going through security she would not be able to make it back to where we were. She asked if she could just pass the stroller over to me but of course, the stroller had to go through security too. So, this meant that I had to carry my backpack, Samuel's backpack and Samuel from one end of the airport to the other, shuttle bus included! And just in case you were wondering if anyone was considerate enough to give us one of the seats on the shuttle bus, the answer is no. Don't ask me how we made it but we did and let me tell you, I have never been so happy to see a stroller before in my life! Next was the dreaded 15 hour flight from Hong Kong to Toronto... I am happy to report however that it was really nothing worth dreading! After dinner I replicated as much as Samuel's bedtime routine as possible and my son laid down, went to sleep and slept a full 11 hours as usual! Samuel slept with his head on my lap and his feet on grandma's lap... Well, remember that my son easily slept on every inch of a king-sized bed in the course of a given night. Now, imagine all that flopping while contained to three air plane seats (two of which were occupied by his mom and grandma!)... Needless to say, neither my mom or I got any sleep but compared to dealing with an over-tired yet awake child for 11 hours, neither one of us was complaining. Once he woke up Samuel wanted to stay on his mama's lap and the only meltdown came when it was time for him to sit back in his seat for landing. I'm pretty sure all the other passengers thought we were killing him but as soon as the seat belt sign was off I picked him back up and he was fine. ...but everything's ok when you've got a Mama to hold your hand. We went through customs in Toronto and it could not have gone smoother. Looking at my landing card the customs officer asked, "Did your son leave Canada the same day you did?". I explained that I had just adopted him and was bringing him home from Vietnam and she said, "That explains the N/A" and sent us on through. Horrible picture of Samuel... best one of his shirt. We boarded the final, 1.5 hour flight to Montreal and although we knew it was the last flight and that it was a short one, we were well aware that Samuel did not understand this and probably thought he was going to spend the rest of his life going from one plane to another! Thunder and lightening kept us stuck on the tarmac for an hour before we finally took off but we were just so thankful the flight wasn't cancelled. and are now stuck on the tarmac just when you were almost there??? And all of a sudden it was over. Five years of waiting to know who/where he was, nine months of waiting to hold him in my arms, twelve days stuck in a hotel room, twenty seven hours of travel and finally, we were home. "He has made everything beautiful in its time...no one can fathom what God has done from beginning to end." This is a beautiful post, Andrea. I've said it before, but I am just so happy for you and Samuel. I have been reading your recent posts and keeping up on you and Samuel. I haven't been able to comment, sorry. Josh has been sick with Lyme Disease, so time has been tight. He is doing better now. Thanks for sharing your journey home. That was a beautiful post. Never think people aren't reading... we love to read. I love it when the precious children come home and momma takes time to share the experience with us. It is so helpful and encouraging for those who are thinking about adopting and so many seem to stop writing as soon as their precious bundle gets home. Keep writing. So happy Samuel done so well coming home. Hugs to you both. Oh I read and I cried! Beautiful...nothing like that feeling of landing in Montreal!!!! Thanks for making me cry! Haha! Seriously, this is wonderful. I've been watching for an update. "All of a sudden it was over" is something I was thinking about just this morning. I'm so eager for the moment that we get through the last checkpoint. What gorgeous homecoming pictures with the family. Treasures for a lifetime! So glad to hear you are home! And that the trip wasn't to awful!